Which came first--the monster or the myth? Journalist Linda Godfrey investigates present-day encounters with mysterious creatures of old. The monsters of ancient mythology, folklore, and more contemporary urban legend have long captured the popular imagination. While most people in America today relegate monsters to just that--our imaginations--we continue to be fascinated by the unknown. Linda Godfrey is one of the country's leading authorities on modern-day monsters and has interviewed countless eyewitnesses to strange phenomena. Monsters evolve, taking on both new and familiar forms over time and across cultures. In this well-researched book, Godfrey explores uncanny encounters with werewolves, goatmen, Bigfoot, and more. In more than twenty-five years spent "chasing" monsters, Godfrey has found that it often remains unclear whether the sightings are simply mistaken animals, hoaxes, or coincidence. When all the speculation is said and done, one question remains for fans and researchers: Are the creatures "real," or are they entirely "other-world?" Godfrey suspects that it isn't an either/or question--our reality operates on a scale from dense matter to realms the human eye cannot see. As Godfrey investigates unexplained phenomena, her search for answers will fascinate casual observers and enthusiasts alike. 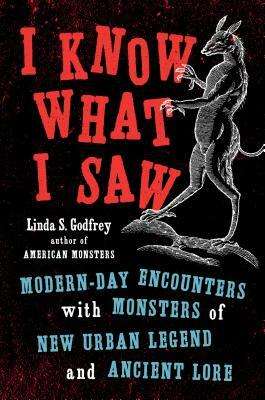 Linda S. Godfrey is one of America's foremost authorities on modern-day monsters. She is the author of more than a dozen books, including Monsters Among Us, American Monsters, Real Wolfmen, and Weird Michigan. A popular media personality, she has appeared on MonsterQuest, Inside Edition, and Coast to Coast AM, among other programs. “The shadowy realm of monsters and weird human-animal hybrids is not limited to the ancient, dusty past, but exists right alongside us today, revealing itself in terrifying ways. There is no better navigator through this bizarre and scary landscape than Linda S. Godfrey, one of the most outstanding researchers in the cryptid field. This book will both thrill and chill you." "The most frightening monsters you can imagine may be lurking in your own backyard. In this unsettling collection of testimonials and anecdotes, veteran monster-hunter Linda Godfrey shows how ancient myths and indigenous legends inform modern sightings of walking wolves, dire dogs, deer people, and other strange beasts in rural America. You will think twice before driving down a country road at night after reading this book."